Is This Funny and Cute or Should I Be Locked Up For Posting It? Do you and I share any of the same reactions to this picture? I laughed out loud when I first saw it and felt warm and fuzzy at the same time. I was curious if it would provoke similar emotions in other people. A Heavy Metal dad and his pre-school son isn’t something you see everyday. It’s thought provoking because it defies convention. I love the irony. The over the top imagery of Heavy Metal combined with the innocence of childhood – like Spinal Tap meets Donna Reed. I was afraid to post this. Humor is risky. But then I read this post about risk and improv by Jane Chin, and then I read this from Copyblogger and it was sealed and delivered. Christine Ulrich who sits outside my office has this picture pinned up in her cube. When I saw it, my intuition said, ‘you gotta post that on your blog’. It says something; I’m not sure what it says, but it says something. Maybe it says – quit taking yourself so seriously and have some fun. I wrote Bill and asked him for permission to use the photo, and he said I could use it as long as I only ripped him and not his son. I’m not going to rip on you or your son. Christine tells me you’re a wonderful dad and you’ve been doing what you love for over twenty years, that’s more than many of us can say. Thanks for letting me use the picture. 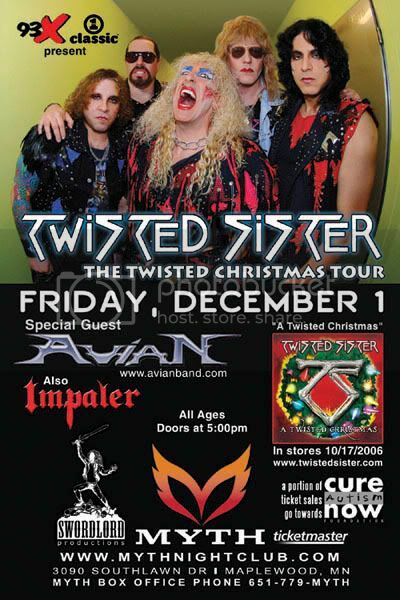 You’ve been at this a long time; your persistence will pay off – Good luck opening for Twisted Sister. I just got another email from Chris Campa at theordinarymystic.com. And he indirectly pointed out something I saw sub-consciously in this picture and I think it’s why I was drawn to it. Yeah! That’s part of it. Like a Yin-Yang visual metaphor. I know, I know, that might be a little much, bit it is there isn’t it? The yin and the yang. I was taking life (and myself) way too seriously until fairly recently. It was only a few months ago I had a breakthrough moment in my personal and spiritual development — I shouldn’t be who I thought I should be, I should just be myself. You know, it’s a lot easier to remember who I am that way. The Bowie/Crosby duet was performed on the Bing Crosby Christmas Special in the mid 70s. Long before MTV, but MTV may have re-aired the song. They sung “The Little Drummer Boy.” I remeber watching it live with my Mother. It is a very happy memory for me. Man, am I grateful for memories like that! I love Christmas! I love Bowie! Thanks for reminding me. Bill’s son’s name is Zach and he is now an adult. I don’t know if he rebeled or not because I don’t know either of them very well. But I do know Zach has been part of Impaler’s show for a while, so I doubt he is part of the Young Republicans or passes out bibles, but ya never know. I’ve seen stranger things in my life. I once ran into three guys wearing “Pat Buchanan for President” shirts at an Ozzy concert and I approached them and said, “What’s the deal? I figured guys like you would be outside protesting” and one of ’em said, “No, I’m here for the show, I love Marilyn Manson and Ozzy.” He seemed serious. Go figure. It didn’t make my smile. It does make me think more about who the person is and not to stereotype a person just from looks. He might be the best father ever but that’s hardly what I would think looking at the picture. That’s a shame and not how I want people to look at me. I think the picture is great! It is a reminder that everyone is real and has other obligations and responsibilities in life.